05/12/18 – Full credits added thanks to David. 18/01/17 – Instructions added thanks to Martin/Stadium 64! 20/11/16 – C64 screens added thanks to Martin/Stadium 64! 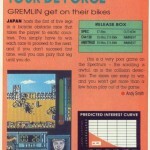 Combining comedy and, er, cycling, Tour De Force was due for release by Gremlin Graphics in 1988 yet never materialized on the C64, despite being released on the Spectrum and CPC. 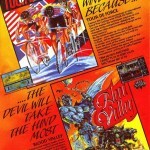 Your objective is to cycle through various locations around the world, in an attempt to win the ‘coveted’ yellow jersey. Various drinks are scattered across the road that you can pick up to keep your rider hydrated, (go easy on the wine though! 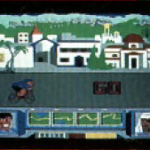 ), whilst sumo wrestlers, thugs, snakes and other riders will try to get in your way and stop you winning the race. So what happened to the game itself? 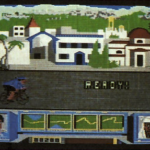 The C64 edition was advertised by Gremlin Graphics that stated that it was due for release on cassette and disk. Does that mean it was mastered and waiting for release at this time? If so then who programmed and worked on it? And why was it not released across all platforms simultaneously? Well, David Plummer got in touch recently and confirmed that he was the developer for the game. He was working for a company in Ottawa, Canada called Aero Animation at the time, where the game was pretty much complete for Gremlin, but the company went under unfortunately before they could supply the game. Very unusual that Gremlin had outsourced to a team in Canada, but then it may have come the way of US Gold’s links, as they had a Canadian team (Sydney Software) who developed titles like Dam Busters. They were ironically based in Ottowa, Canada – so it could be that it was the same company perhaps? Although David has the source code still to the game, he has chosen not to release it out of loyalty. 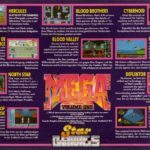 We may have to hope to find the game via another source for it to be properly preserved and enjoyed for the first time. 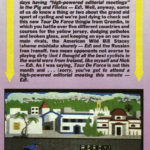 For now, check out the newly found C64 screenshots, thanks to Martin / Stadium 64! 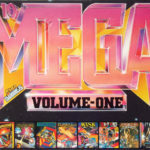 In 2017, contributor Sean O’Neill found that the game was almost released on the 10 Mega Games Volume One compilation. It even featured on the cover and on the back, but was found that at the last minute was replaced on the tape with Cosmic Causeway. A shame, and something which almost made it out! 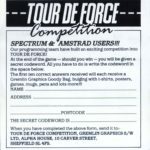 Martin/Stadium 64 also found that C64 instructions were included in the released Spectrum/Amstrad versions. It seems that Gremlin must have had a preview copy or something at some stage – so there could be something small to find of the game some day. Hopefully of course David will change his mind and release what he has. 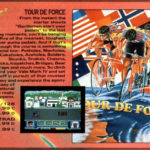 While it would be good news if the C64 version of Tour De Force was discovered and preserved, I believe that Cosmic Causeway was better addition to 10 Mega Games collection as a game. After all, it was a sequel to Trailblazer and had some genuine improvements over its predecessor although at the expense of training and two player modes. 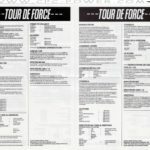 All of them have instructions for the c64-version. Look at how the scoring/hints for the c64-version differs from the released Spectrum/Amstrad-versions. I got very excited for a moment, but then found they replaced it with Cosmic Causeway. If you look at the tape images, they swapped it and must have put an apology note in the box. Pretty gutting! I wrote the C64 version, with I think the Spectrum being done a little earlier in the UK. The game was 95% finished when the company I was writing it for went under (a subcontractor to the publisher). So the game was indeed written and mostly finished, but I have no idea if the code ever got released.